Maggie is one wonder noodle pack that one can always find in my pantry. Though mostly I use Maggie Masala Flavor, I always add my style to it than routine maggie recipe. I should say these days they are coming up with more variety flavors like Pulavo, Chilli Chow, Chatpata, Sambar. But mostly I stick to Masala flavor and Chilli chow comes next. Usually i try to sneak cabbage in most of the Indo -Chineese dishes as my hubby can not notice it ( is the first reason), and sauted cabbage gives very good flavor to your Chinese version of noodles or fried rice. Bell Pepper is another veggie that gives very good taste to your Noodles and adds lot of color. With the excitement of finding Banana Peppers recently here in Bangalore, did not realize that I have bought so many of them, even after making Stuffed Banana Peppers there are quite a few left in the fridge. You know now where this is going, and Yes as the title says, today I replaced the cabbage with red cabbage and bell pepper with Banana Pepper in the noodles, and the result is this Yummy looking Colorful Noodle Plate. 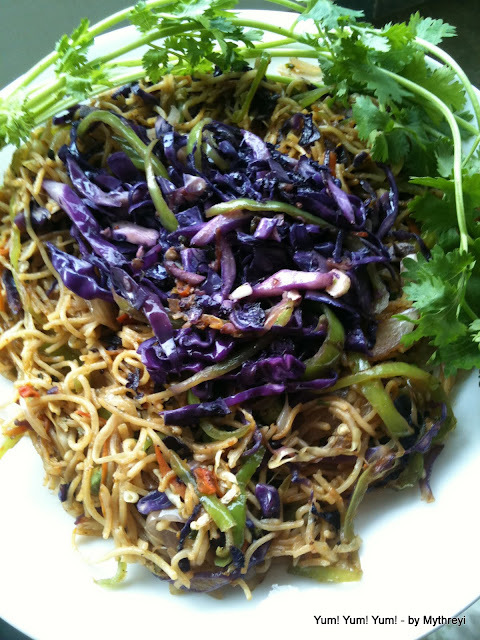 Along with the Color, Red Cabbage and Banana Pepper gave such a crunchiness to these Noddles, this recipe won everybody's heart in my family. 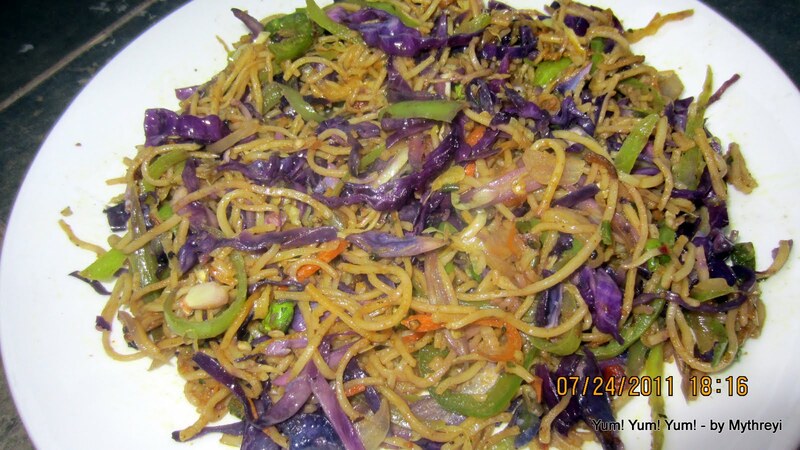 Don't envy my colorful noodle plate, here is the recipe for you, Enjoy!!! Note: Check out how i sneaked in red cabbage in Red Cabbage Bullets and in Marble Idli previously. Heat the oil in the wok ( or wide non stick pan) and add thinly sliced onions and chili. Cut the Red Cabbage, Banana Pepper and Carrot length wise into thin strips. add them to the wok. Add salt and black pepper and saute the vegetables gently with out breaking them up. Add the cooked Noodles to the wok and give a quick stir so that vegetables will mix into noodles. Now add the Maggie Masala to the noodles and mix it into noodles gently. Serve into Plate and garnish with cilantro and watch your little ones dig into this yummyness. 1. The time to Microwave your noodles depends on your microwave power. Adjust the time accordingly. 2. I always cut my vegetables into long thin strips so that they will be sync with the noodles length and makes it look perfect in your plate. 3. Do not over cook the Red Cabbage, the nice purple color changes into dark very quickly. So watch out for that when you are sauteing. 4. Adding the Masala at the end gives me the flexibility to take out some for kids before adding the masala. So kids can have less spicy version with out missing the veggie goodness in it. I have sent this recipe to Jabeen's IftarNights Event. This looks really colorful and healthy..
very yummy i love noddles with loads of veggies n this is it!!! Thanks for your comment on my blog (http://www.sadaf-culinaryadventures.blogspot.com). I have been a big Maggi fan since childhood.....will definitely try it your way soon. Mythreyi, this is just stunning! I love that you cut the vegetables in long thin strips to go with the noodles. 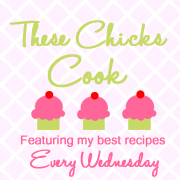 I am so excited about this dish and can't wait to try it out. The color in this dish is awesome, it looks delicious! Thank you so much for sharing with Full Plate Thursday and hope to see you again real soon. Hope you are having a great week!